Coal Harbour - Experience the marina and beauty of Coal Harbour in downtown Van! Coal Harbour is the name for a section of Burrard Inlet lying between Vancouver's downtown peninsula and the Brockton Peninsula of Stanley Park. It is also in recent years the name of the neighborhood adjacent to its southern shoreline, which was dramatically redeveloped as a high-rise condominium district in the 1990s. 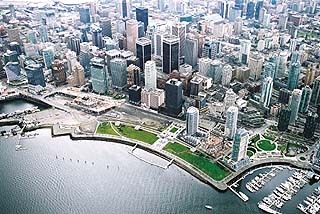 The harbour is bounded by downtown Vancouver to the south and Stanley Park to the north. To the east is Deadman's Island, the site of the naval station/museum HMCS Discovery, where the harbour opens up to the Burrard Inlet. The discovery of coal in the harbour in 1862 inspired the name. Within the harbour is a floating gas station for marine vessels. This neighborhood is home to Vancouver Harbour Water Aerodrome, located a few blocks from Canada Place. The neighborhood is bounded to the southeast by Burrard Street, to the southwest by West Georgia and Hastings Streets, and to the northwest by Stanley Park. The northwestern section features parkland, private marinas, and several rowing and boating clubs. Towards the central business district in the southeast, and across Georgia Street, the neighborhood is dominated by high-rise office and apartment buildings. The six floating homes in Coal Harbour are the only legal floating homes in the city. The area offers great views of the North Shore mountains, Stanley Park, Lions Gate Bridge and east to Canada Place and the port beyond. With its close proximity to Stanley Park, Denman Street, Robson Street and Vancouver's financial core, Coal Harbour is fast becoming one of Vancouver's preferred neighborhoods. A beautifully landscaped walkway connects Coal Harbour to the Stanley Park seawall giving residents easy access to the parks' running and bike trails. There is also a community center, playgrounds, a marina, a children's water park and several restaurants accessible from the seaside walkway. Float plane service from the foot of Burrard Street allows Coal Harbour residents a convenient means of reaching Vancouver Island, the Gulf Islands and points beyond. Vancouver's downtown heliport is also just minutes away--making Whistler, Victoria and Seattle a short helicopter commute from home. Check out this map to familiarize yourself with the neighborhood! I really enjoy walking along the seawall in Coal Harbour and enjoying the waterfront park in this area. Here are several pages of pictures that I took during one the last times I visited Vancouver.